Haas, M. R. & Cummings, J. N. (2015). Barriers to knowledge seeking within MNC teams: Which differences matter most?. Journal of International Business Studies, 46(1), 36-62. Carton, A. M., & Cummings, J. N. (2013). The impact of subgroup type and subgroup configurational properties on work team performance. Journal of Applied Psychology, 98(5), 732-758. Cummings, J. N., Kiesler, S., Zadeh, R., & Balakrishnan, A. (2013). Group heterogeneity increases the risks of large group size: A longitudinal study of research group productivity. Psychological Science, 24, 880-890. Carton, A. M., & Cummings, J. N. (2012). A theory of subgroups in work teams. Academy of Management Review, 37(3), 441-470. Cummings, J. N., & Haas, M. (2012). So many teams, so little time: Time allocation matters in geographically dispersed teams. Journal of Organizational Behavior, 33(3), 316-341. Linville, P. W., and Fischer, G. W (2004). From basketball to business: Expertise, perceived covariation and social judgment. In V. Yzerbyt, C. M. Judd, & O. Corneille The Psychology of Group Perception: Contributions to the Study of Homogeneity, Entitivity, and Essentialism (pp. 179-202). London: Psychological Press. Luce, M. F., Jia, J., and Fischer, G. W (2003). How much do you like it? Within-alternative conflict and subjective confidence in consumer judgments. Journal of Consumer Research, 30, 464-472. Huber, J., Ariely, D., and Fischer, G. W (2002). Expressing preferences in a principal-agent task: A comparison of choice, matching, and ratings. Organizational Behavior and Human Decision Processes, 87, 66-90. Fitzsimons, G. M., Sackett, E., & Finkel, E. J. (2016). 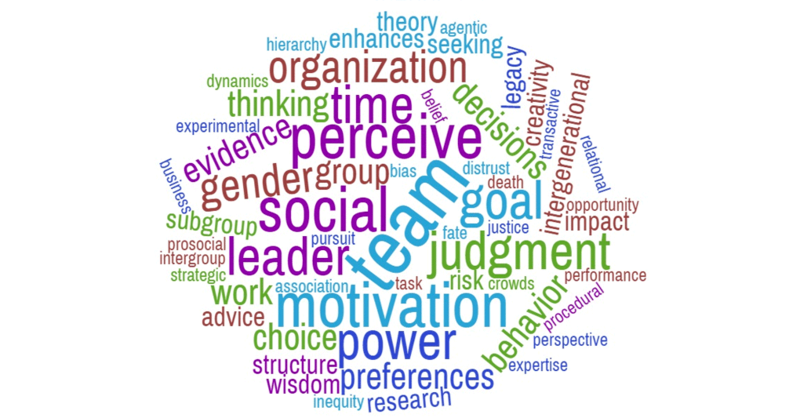 Transactive goal dynamics theory: A relational goals perspective on teams and leadership. Research in Organizational Behavior, 36 , 135 – 155. Shea, C., T., & Fitzsimons, G. M. (2016). Personal goal pursuit as an antecedent to social network structure . Organizational Behavior and Human Decision Processes, 137, 45 – 57. Laurin, K. Fitzsimons, G. M., Finkel, E. J. et al. (2016). Power and the pursuit of a partner’s goals . Journal of Personality and Social Psychology, 110, 840 – 868. Fitzsimons, G. M., Finkel, E. J., & van Dellen, M. R. (2015). Transactive goal dynamics. Psychological Review, 122, 648 – 673. Koval, C. Z., vanDellen, M. R., Fitzsimons, G. M., & Ranby, K. W. (2015). The burden of responsibility: Interpersonal costs of high self-control. Journal of Personality and Social Psychology, 108, 750-766. Tang, S., King, M., & Kay, A. C. (2018). Fate as a Motivated (and De-Motivating) Belief: Evidence for a Link from Task Importance to Belief in Fate to Effort. Organizational Behavior and Human Decision Processes, 144, 74-84. Fath, S., Proudfoot, D. & Kay, A. C. (2017). Effective to a fault: Organizational structure predicts attitudes toward minority organizations. Journal of Experimental Social Psychology, 73, 290-297. Proudfoot, D., Kay, A. C., & Mann, H. (2015). Motivated employee blindness: The impact of labor market instability on judgment of organizational inefficiencies. Organizational Behavior and Human Decision Processes, 130, 108-120. Proudfoot, D., Kay, A. C., & Zhou, C. (2015). A Gender Bias in the Attribution of Creativity: Archival and experimental evidence for the perceived association between masculinity and creative thinking. Psychological Science, 26, 1751-1761. Friesen, J. P., Kay, A C., Eibach, R. P., & Galinsky, A. D. (2014). Seeking structure in social organization: Compensatory control and the psychological advantage of hierarchy. Journal of Personality and Social Psychology, 106, 590-609. Minson, J. A., Mueller, J. S., & Larrick, R. P. (forthcoming). The contingent wisdom of dyads: When discussion undermines versus enhances the accuracy of collaborative judgments. Management Science. de Langhe, B., Puntoni, S., & Larrick, R. (2017). The pitfalls of linear thinking in a non-linear world. Harvard Business Review. Tost, L. P., Gino, F. , & Larrick, R. P. (2013). When power makes others speechless: The negative impact of leader power on team performance. Academy of Management Journal, 56, 1465-1486. Tost, L. P., Gino, F., & Larrick, R. P. (2012). Power, competitiveness, and advice taking: Why the powerful don’t listen. Organizational Behavior and Human Decision Processes, 117, 53-65. Hulst, J. E., Van den Bos, K., Akkermans, A. J., & Lind, E. A. (2017). On why procedural justice matters in court hearings: Experimental evidence that behavioral disinhibition weakens the association between procedural justice and evaluations of judge. Utrecht Law Review, 13(3), 114-129. Lind, E.A., & Arndt, C. (2016). Perceived Fairness and Regulatory Policy: A Behavioural Science Perspective on Government-Citizen Interactions. OECD Regulatory Policy Working Papers, No. 6, OECD Publishing, Paris. Lind, E. A., and Sitkin, S. (2015). The Six Domains of Leadership. Columbia, SC: Learning with Leaders. Lind, E. A., & Van den Bos, K. (2013). Freeing organizational behavior from inhibitory constraints. Research in organizational behavior, 33, 79-95. Van den Bos, K., & Lind, E. A. (2013) On Sense-Making Reactions and Public Inhibition of Benign Social Motives: An Appraisal Model of Prosocial Behavior. In J. Olson and M. Zanna (Eds. ), Advances in experimental social psychology, Vol. 48.1-58. San Diego, CA: Academic Press. Atlas, S. A., Johnson, E. J., & Payne, J. W. (2017). Time preferences and mortgage choice. Journal of Marketing Research, 54(3), 415-429. Shu, S. B., Zeithammer, R., & Payne, J. W. (2016). Consumer preferences for annuity attributes: Beyond net present value. Journal of Marketing Research, 53(2), 240-262. Venkatraman, V., Payne, J.W. & Huettel, S.A. (2014). An overall probability of winning heuristic for complex risky decisions: Choice and eye fixation evidence. Organizational Behavior and Human Decision Processes, 125, 73-87. Venkatraman, V., Payne, J.W., Bettman, J.R., Luce, M.F., & Huettel, S.A., (2009). Separate neural mechanisms underlie choices and strategic preferences in risky decision making. Neuron, 62, 593-602. Payne, J.W., Samper, A., Bettman, J.R., & Luce, M.F. (2008). Boundary conditions on unconscious thought in decision making. Psychological Science, 19, 1118-1123. Rosette, A.S. & Koval, C. (forthcoming). Framing advantageous inequity with a focus on others: A catalyst for equity restoration. Journal of Experimental Social Psychology. Rosette, A.S., Koval, C., & Ma, A. (2016). Race matters for women leaders: Intersectional effects on agentic deficiencies and penalties. The Leadership Quarterly, 27, 429 – 445. Rosette, A.S., Lebel, D., & Mueller, J. (2015). Are male leaders penalized when seeking help? The influence of gender and asking behaviors on agentic perceptions. The Leadership Quarterly, 26(5), 749 – 762. Rosette, A.S., Carton, A., Bowes – Sperry, L. & Hewlin, P. (2013). Why do racial slurs remain prevalent in the workplace? Integrating theory on intergroup behavior. Organization Science, 24(5), 1402 – 1421. Rosette, A.S. & Tost, L. (2013). Perceiving social inequity: When subordinate group positioning on one dimension of social hierarchy enhances privilege recognition on another. Psychological Science, 24(8), 1420-1428. Searle, R., Nienhaber, A., & Sitkin., S. (eds.). The Routledge Companion to Trust. Abington, UK and New York, NY: Routledge. 2018. Long, C. & Sitkin, S. Synthesizing the research on the control/trust relationship (conditionally accepted). Academy of Management Annals. Sitkin, S. B., Miller, C. C., & See, K. E. (2017). The Stretch Goal Paradox. Harvard Business Review, 95(1), 93-99. Bijlsma-Frankema, K., Sitkin, S. B., & Weibel, A. (2015). Distrust in the balance: The emergence and development of intergroup distrust in a court of law. Organization Science, 26(4), 1018-1039.
van Knippenberg, D., & Sitkin, S. B. (2013). A critical assessment of Charismatic-Transformational leadership research: Back to the drawing board? The Academy of Management Annals, 7, 1-60. Palley, A. B. & Soll, J. B. (forthcoming). Extracting the wisdom of crowds when information is shared. Management Science. Rader, C. A., Soll, J. B., & Larrick, R. P. (2015). Pushing away from representative advice: Advice taking, anchoring, and adjustment. Organizational Behavior and Human Decision Processes, 130, 26-43. Soll, J.B., Milkman, K.L. & Payne, J.W. (2015). Outsmart your own biases, Harvard Business Review, May, 65-71. Mannes, A. E., Soll, J. B., & Larrick, R. P. (2014). The wisdom of select crowds. Journal of Personality and Social Psychology, 107, 276-299. Soll, J. B., & Larrick, R. P. (2009). Strategies for revising judgment: How (and how well) people use others’ opinions. Journal of Experimental Psychology: Learning, Memory, and Cognition, 35, 780-805. Fox, M., & Wade-Benzoni, K.A. (forthcoming). The creation of opportunity is an opportunity to create: Entrepreneurship as an outlet for the legacy motive. Research in Organizational Behavior. Bang, H.M., Koval, C.Z, & Wade-Benzoni, K.A. (2017). It’s the thought that counts over time: The interplay of intent, outcome, stewardship, and legacy motivations in intergenerational reciprocity, Journal of Experimental Social Psychology, 73, 197-210. Tost, L.P., Wade-Benzoni, K.A., & Johnson, H. (2015). Noblesse oblige emerges (with time): Power enhances intergenerational beneficence. Organizational Behavior and Human Decision Processes, 128, 61-73. Wade-Benzoni, K. A., Tost, L. P., Hernandez, M., & Larrick, R. P. (2012). It’s only a matter of time: Death, legacies, and intergenerational decisions. Psychological Science, 23, 704-709. Grant, A.M., & Wade-Benzoni, K.A. (2009). The hot and cool of death awareness at work: Mortality cues, aging, and self-protective and prosocial motivations. Academy of Management Review, 34, 600-622.